We’ve followed the traditional French method of making mousse au chocolat, using just a few ingredients to make this decadent dessert. While this recipe is incredibly simple, there are a few important things to note. First is the temperature of the eggs, which we mentioned above, but is so important it bears repeating. Second, when you stir your chocolate/egg yolk mixture into your beaten egg whites they will deflate quite a bit. Don’t panic! 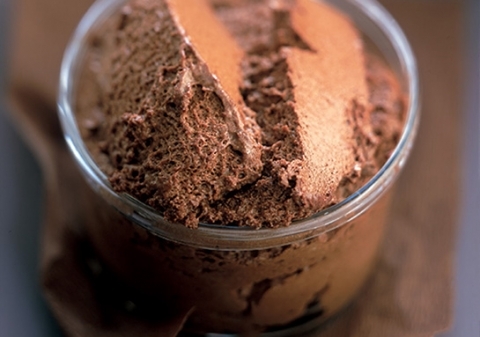 Your mousse mixture should be pour-able as you’re putting it into your serving dishes. That’s why we let it chill for 4 hours to set. All will be good after some time in the refrigerator. Instructions Melt the chocolate either in a double boiler or in the microwave on low heat. Set it aside to cool slightly. In a medium bowl, beat the egg whites to stiff peaks. Lightly beat the room temperature egg yolks with the sugar, vanilla, and salt to mix. Slowly add the egg yolk mixture to the melted chocolate. Gently stir the chocolate mixture into the stiff egg whites, using 1/3 of the chocolate at a time. Pour or spoon the mixture into serving bowls.